Ozark area paddlers should mark your calenders for The Arkansas Canoe Club 2007 Rendezvous event which is scheduled to be September 14-16, 2007 at Camp Couchdale on Lake Catherine near Hot Springs, AR. This is the largest paddlers rendezvous in the area. Expand your network, test new boats and make new shuttle partners! 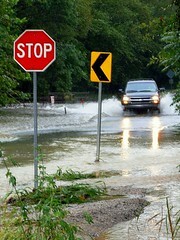 Okmulgee Creek is flooded out again, but the roads have mostly cleared. Erin tracked right along i-40, so we took a trip to our river lot in Pierce to make sure our RV hadn't floated away. The North Canadian River is up very high, nearly as high as when it flooded a few months ago...and it is still rising. I didn't paddle it today, but it was running fast and carrying large trees downstream to Lake Eufaula. Somehow the flooding appears to have dmaged two water mains that kept us dry at our house from 10pm Sunday night to around 6pm this evening. The water pressure is still low at 8:45pm, so I figure they are still working on it. I hope it raises the water level on the Illinois River a few feet. I'm itching to make a trip down the river, now that the summer peak traffic season is ending. Been paddling somewhere lately? Drop me a comment on the Oklahoma Road Trips blog, i would love to hear about your adventures! Although paddling options can be limited this time of year in Oklahoma, most Okies are blessed to live near a reservoir lake. We have two here in the Okmulgee area. i usually paddle what is locally known as the 'New Lake" or Dripping Springs Lake. I like shooting pictures of the strange reflections of drowning trees on Dripping Springs Lake and you don't have to dodge as many ski boats. However, Friday after work I needed a quick bit of excercise to unwind and decided to stop by Okmulgee Lake. Locally this is known as the "Old Lake" and tends to see quite a bit of fast boating action. In fact, they host boat racing and wakeboarding competitions here. 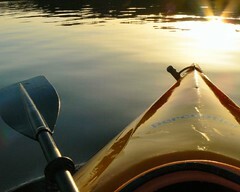 I like to slip my kayak in near the lake's spillway off Highway 75 and paddle around in the golden sunset light. I try to keep close to the shore to avoid collisions with faster craft. Naturally, one must be careful not to paddle OVER the spillway unless your life lacks adventure. My Panasonic DMC-FZ7 loves this kind of light, as long as you don't shoot directly into the sun. I can't resist shooting into the lovely warm light, so I get quite a few lens flares. 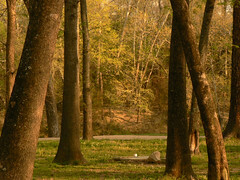 I wish I had some of those cool Cokin Landscape Filters , it looks like you can have light like this anytime with those! In the summer time I go Sunset Kayaking around 7pm. This allows me to scout around a bit and get some excercise before the light starts getting interesting. It pays to have a late afternoon snack first as the light doesn't completely fade until around 9pm. At dinner, expect to eat like you just got a tip on a famine! Oklahoma paddlers have recently received notice that the river flow gauges on many of Oklahoma most scenic rivers will be shut down in August due to lack of state funds to keep them operational. This really hurts Oklahoma canoe and kayak paddlers who need to know the river level before planning a river trip and it is no boon to public safety either. Outfitters like, Tom at K-River Campground will also have trouble giving recommendations for safe canoe trip scheduling. The amount of money the state will save is tiny and it will really damage a lot of small Oklahoma toursim business operators. If you want to help out just send an email to your state representative. For the Kiamichi River area it is R.C. Pruett, at rcpruett@okhouse.gov. Our state representatives need to push for state funding for these gauges. The OSRC holds 3 Illinois River Cleanups each summer, scheduled for the Friday following each of the major holidays - Memorial Day, July 4th, and Labor Day. To participate in a cleanup, volunteers should contact the OSRC by the Wednesday prior to the cleanup, at (918) 456-3251, or at osrc2@fullnet.net. The OSRC and canoe livery operators along the River, with help from Save the Illinois River (STIR) and other local agencies, have sponsored canoe-based trash cleanups two or three times a year, on Fridays following major holidays (Memorial, Independence and Labor Days). Free canoes and trash bags are provided to participants willing to collect trash along an approximately 6-mile stretch of the River. Participants who bring in trash can also register for a drawing for a new canoe, which will be given away during the post-Labor Day cleanup (Sept. 8 this year).